As dry is the southern part of Hawaii Big Island, wet and lush is its northern end. Sitting on the most ancient of the island's volcanoes, the domain of Kamapua'a is battered by the trade winds, harbingers of rain. It is a stark contrast with the desert black rock wasteland of the Volcanoes Park. 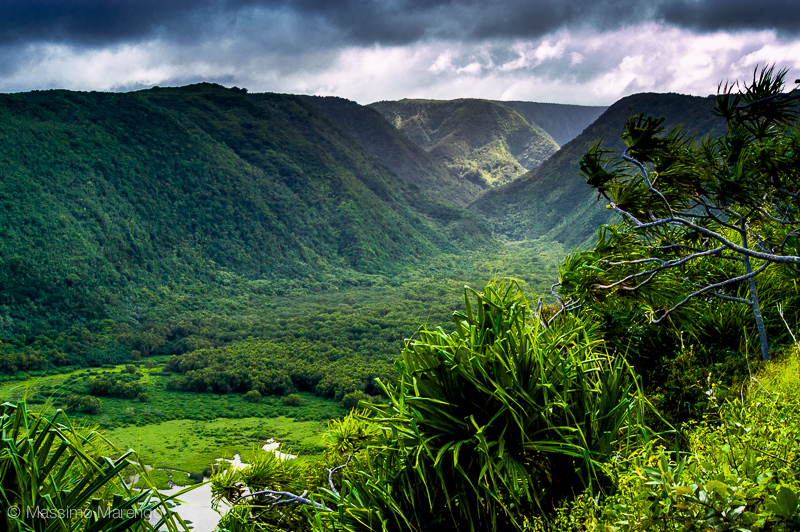 One of the most picturesque spots of the green north is the Pololu valley. To reach it you have to drive around the north tip of the island, either along the trafficked coastal road (Maukona-Niulii Rd), or along the Kohala Mountain Rd. We chose the latter: the road starts from Waimea (allowing a brief visit to the Keck Observatory Headquarters) and climbs on the flanks of the Kohala mountain. Estimated to be 1,000,000 years old, it is now extinct, having last erupted more than 160,000 years ago. It is highly eroded, covered by green pastures on the western side and deep valleys on the eastern side. Driving along the mountain road one can be excused to think, for a moment, that this is not Hawaii but Ireland (see panoramic photo below). 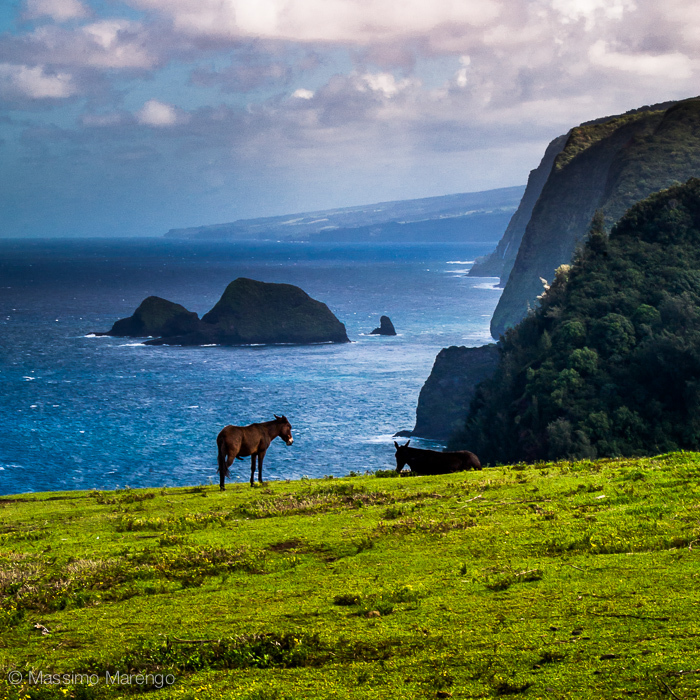 The landscape is dotted by cows and horses: cattle raising is the main industry of this area, spawning the tradition of the Hawaiian cowboy equivalents. The road ends in Hawi, a small town of less than 1,000 people, significant because its territory includes the birthplace of Kamehameha I the great. From Hawi you should follow route 270, literally to the end of the road. You park the car, walk to the side of the road and, lo and behold, you see the view in the large photo above (well, I cannot guarantee that you will still see the same horses next time you go there). The huge cliffs are the result of hundreds of millennia of erosions by the ocean and the rain on the tired igneous rocks of Kohala. Hidden between the cliffs is the long narrow Pololu valley, which you can see in the small photo on the left. From the parking lot at the Pololu lookout you can walk down (on a 400 ft steep sandy trail) to the bottom of the valley. The valley is all private land, so there is not much you can do there unless you ask permission to walk the swampy trails that cross it through its length. The beach at the end of the valley, however, is quite a spectacle, thanks to its black sand and high surf typical of Hawaii eastern coast. It is a popular destinations, provided of course that you are willing to climb up all 400 ft of trail to get back to the car, on your way back home.